I try to ask the fundamental questions. I believe that, in the context of what Conshohocken in undergoing, the question I ask is the most fundamental of all. I don’t live in Conshohocken, and never have, and don’t believe I have a voice in the specific issues that are confronting the Borough, this project or that one. I am, however, trained to take the long view, to identify the historical patterns evident amidst the details, and for that reason what is happening in “the Conshohockens” fascinates me. We live in exciting times: a major turning point in the history of both boroughs is well underway. 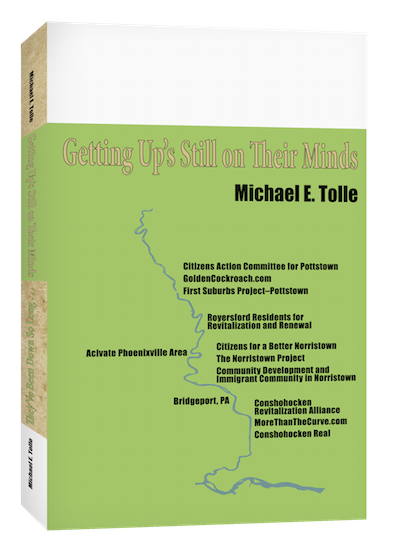 The past is past and over with; the future will not only be different from the past, that future will be different from that of the other six towns on the lower Schuylkill River, for the very first time in their collective history. I do not remember the old Conshohocken, the self-centered industrial community with a crowded downtown. I began to visit Conshohocken only in the middle 1980s, when I twice a week delivered first one son and then another to DeStolfo’s School of Tae Kwon Do, then located in the P.O.S. of A. building on Fayette Street. My route took me past the old Alan Wood works, to the core of downtown before turning left up the hill, and then reversed itself for our return. It was a depressing experience. Years of brief, repetitive views caused me to arrange what I saw as a series of historical vignettes, as is my wont. As I drove along Conshohocken State Road past the remnants of Alan Wood Steel, the site showed but flickering signs of life. I tried to imagine what that stretch would have looked, sounded and smelled like in earlier times, with the furnaces in operation and the many workers passing each other between shifts, but it was difficult. I’m old, but not that old. Next came a passage down western Elm Street, a stretch of simple, unadorned row housing built for the workers at the then-nearby plants before the days of the automobile. Their original occupants didn’t have cars, and didn’t need them. Their successors did, because they had to; they could no longer walk to work. This bit of historical timing meant that the current residents had to deal with both the lack of parking spaces for the own cars and the speed with which other people’s cars drove past their front doors. Signs implored drivers to obey a resident-friendly speed limit, which, if memory serves, was routinely ignored. My memories of downtown are simple: fences, just fences. In the early 1980s downtown Conshohocken did not exist; it had been removed under the Federal Urban Renewal Program. Therein lies a tale, for at the time the conventional wisdom was that a huge mistake had been made, and not just because of all the old buildings that had been demolished. The critics had a point. Conshohocken’s Urban Renewal effort was the last one the Federal Government ever contracted for. In fact, by the time Conshohocken jumped on board, the Urban Renewal Program was already being judged a national failure. Locally, the condition of an Urban Renewal project just up the river in Royersford should have been a sobering reality check. 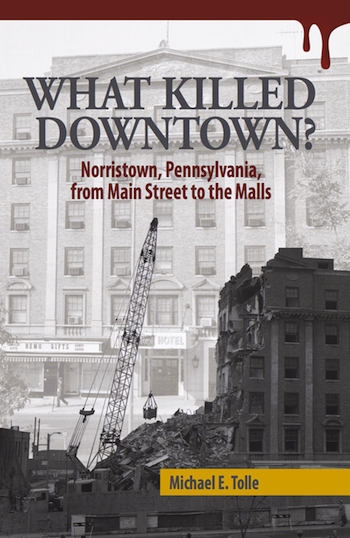 Be that as it may, the contract was signed and old downtown Conshohocken proceeded to fall under the wrecker’s ball. As with Royersford, the removal and teardown was easy to accomplish; the revival of new buildings, new businesses and new residents, not so much. In the mid-1980s, to passersby like myself, it seemed like nothing was happening. But appearances were deceiving. Things were happening, but Urban Renewal had nothing to do with it. The only project in the long record of new developments that can properly be considered as part of the Urban Renewal effort was the first one, the Pleasant Valley Apartments. This was a “Section 8” project, and I first wrote about it back in May of 2013, because it was being pitched on a website as the first of the successes that would follow. While the same developer was retained, what followed wasn’t Urban Renewal, but a much older and much more fundamental process. The process that gathered steam and began to reshape Conshohocken during the 1980s was a very traditional American one: develop a large property by letting private enterprise develop portions of it at a time, for their own reasons and on their own timing. For these developers, Conshohocken’s removed downtown was welcomed, because it saved them the cost of doing the same thing, which was what they had in mind anyway. By the time I began to view Conshohocken on a regular schedule, the transformation of both boroughs was already well underway, but largely just in the sketches of developers. Only the first steps had yet established a physical presence, and they had taken a long time to do that. The process actually began in the late 1940s, when work on the Schuylkill Expressway got underway. A small portion in West Conshohocken was one of the first segments to open, but was of little use. The full Expressway did not open until 1960. This certainly helped, but for several years Conshohocken was just an off-ramp of a single road, that was actually located in West Conshohocken, which received no mention. This is where the long and tangled tale of what is now known as Interstate 476 enters the picture. There may have been more controversial sections of the Interstate System, but few have been opposed by people with such deep pockets. The construction of the whole road gives new meaning to the term “spasmodic.” Delaware County was the site of my first visits to Southeastern Pennsylvania, back in the late 1960s. I would periodically drive down Bryn Mawr Avenue, underneath a section of road upon which I never saw any traffic. My curiosity aroused, I learned that it was an early portion of what was then known as “The Blue Route.” It carried no traffic because it connected nothing to nothing. Years passed and portions were built, and the promise of the future began to be glimpsed from the Conshohockens. The connection to Norristown was welcome, with its wide new bridge, but the real northward goal was the Pennsylvania Turnpike, including its “Northeast Extension,” and that took a long time to achieve. The southward connection was opened from Interstate #95, and with the final link to the turnpike completed at long last, the Conshohockens found themselves at the intersection of two heavily-traveled highways, the new Interstate 476 and the much-updated Schuylkill Expressway which had some time earlier become Interstate 76. With that, the fate of both towns was sealed. Make no mistake about it: what has happened, and what will happen, to both Conshohockens has been and will be the direct result of that intersection of Interstate highways. Private enterprise is succeeding where a government program failed, but its success is due to timing, and, of course, two (government financed) roads. What has been happening to both the Conshohockens has nothing to do with either of the boroughs themselves; they just happened to be there when the connection was completed. So were people, who by now should feel just as ignored, if not more so. Let’s call them “The Old.” They are those residents who experienced this multi-decade process, or their children (“Old” is a very relative term). Often descendants of earlier residents, they are the ones who did not leave, when so many did. They are proud of their community history and remain locally focused, as the residents of both towns historically have been. Few now alive can remember "the good old days,” but The Old recognize their place in a long tradition, a place that may even include residence in the old family home. Their local focus makes them the backbone of the community, as it always has. They are also the most aware that the people who occupy the new buildings—whether during the day or the night—do not share that focus. The implications for Conshohocken from the influx of The New are potentially more significant than those that will arise from the buildings they occupy. The New may be a heterogeneous lot, but they will all share one fundamental difference from The Old. That difference may well determine what kind of community the new Conshohocken becomes. They say that people who ignore history are doomed to repeat it. We need to be very careful about that, however. It’s not about remembering history, it’s about learning the lessons that history offers. In Pennsylvania's lower Schuylkill Valley, one of those lessons is that history provides almost no guide for the present or the future. Not only have things changed, they have virtually reversed themselves. 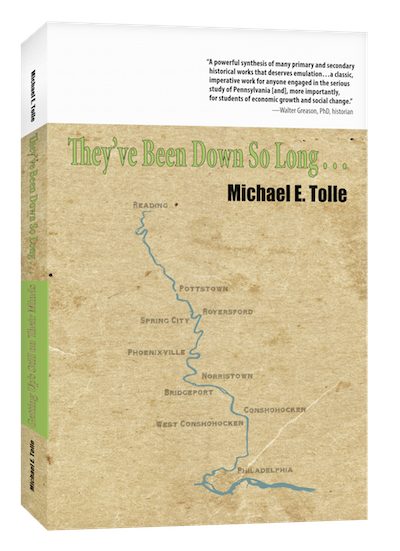 The most fundamental change has been that of the Schuylkill River itself. A result of that change (and only one of them) is a complete reversal in the historic relationship between the river and the towns that occupy portions of its floodplain. The most obvious evidence of this change is seen in the Conshohockens, but that is the result of outside economic forces, not the leadership or the populations of either town. I will focus on that part of the change next week. This week it’s about the broader change itself. Every one of the Schuylkill River towns, as it grew, developed the same relationship with the river. That relationship had two aspects: the towns drew drinking water from it and dumped sewage and industrial wastes into it. Those activities were, in turn, largely undertaken by private enterprise, with only occasional and loose supervision by any municipal authority. Back then, no one even thought of limiting the options of “job creators.” It did not take long for the basic incompatibility of these two uses to become evident, and because it was much cheaper to filter water drawn from the river than to ban dumping into it, that course was followed. The result was that the Schuylkill River, during the glory days of the towns along it, was avoided by all who could do so. The river was little more than an open sewer, particularly in the periods of warm weather and low flow. The riverbanks hosted the railroad and the industries it serviced, with the shopping streets very close by. The floodplain itself, the site of both factories and railroads, was a scene out of Dante’s Inferno, fiery hot, noisy and shrouded in a noxious atmosphere. This was true in every town; only the names of the contributors differed. This meant that of all the possible uses of the river during the glory days of the towns along its course, Residence and Recreation were at the bottom of the list. In “the good old days” of the Schuylkill River towns, the only people who lived at the river’s edge were the economic and social dregs of the community, the day laborers, the semi-bums, alcoholics, and those who for one reason or another could not afford to live anywhere else. The river flooded often in these lowest parts, and it stank all the time when you were living that close. In those days, a family’s relative wealth could be determined by how far away it lived from the river. The better off the family, the farther up the hill it lived. As for recreation, well, there were brave attempts, some of which actually became locally popular for a brief time. These efforts, whether private clubs or businesses, all utilized the water’s surface, of course. If you immersed yourself in the river, the coal culm left you more grimy than when you entered, not to mention other objects or organisms that might have attached themselves to you. Even the boaters had to contend with the smell, not to mention the steady stream of unpleasant objects floating ever so slowly downriver. In “the good old days,” people sought their leisure on higher ground. Since then, industry has largely departed—the biggest ones in particular—and the old, decrepit buildings it left behind have been almost all torn down. The railroad is a mere shadow of itself, a commuter line for the Conshohockens and Norristown, and stretches that are still used—infrequently—for product transportation. All use electric or diesel power, so smoke and some noise have also disappeared. The departure of the industrial and transportation polluters together with government mandates for municipal sewage systems have combined to make enormous strides in cleaning up the river. The Schuylkill now is hugely different from “back in the day.” It deserves its place as one of the proudest achievements of the Pennsylvania Scenic River System Program. The result of all this is that today, the relationship between the river and the towns along it has exactly reversed itself. Residence and Recreation now top the list of popular activities along the Schuylkill River. Today, people pay more—sometimes much more—to live along the river. This would have been incomprehensible to everyone who lived in the Schuylkill basin prior to World War II. As for Recreation, well, I could spend an entire post just listing the many ideas for enjoying the river that are making the news today, and could employ several posts to talk about them. Some are traditional, such as rowing, a Pennsylvania tradition. But history is not the point, not when it comes to the river. Dragon Boat Racing does not have much of a history on the Schuylkill River (you can take my word for it; I’m a Historian), but the club in Norristown symbolizes just how little you need feel bound by what they did way back when, and how you can start your own traditions, from just about any source (It also reminds all potential new users of the river what we of long-time residence along the river already know: if you don’t secure it, it will float away). The need to actually ignore history is true not just for private groups, but for the river towns themselves, at least most of them. As history no longer serves as a guide, those towns whose riverfronts are not in much demand, Norristown and Bridgeport to name just two, can pretty much start from scratch. No so for the Conshohockens. I’ve already mentioned the reason for this, but it cannot be overemphasized, because it has brought big money to the area. That’s crucial, because a major difference between Residence and Recreation is that the former requires a great deal more upfront expenditure of capital. New single-family houses along the river would be quite expensive, and no one is building those. Not enough profit in it. What we are seeing are largely condominium or rental complexes of considerable size. They occupy former industrial sites, because rehabilitation projects for such sites (“brownfields”) get lucrative financial subsidies and because, in the right location, they can be very profitable. There is one in West Norriton, and even a proposal pending for Bridgeport (although I am not sure of its current status). Right now, however, the hot location for residences is the Conshohockens. The new residences—and the new office buildings also—are evidence that the two boroughs will experience a very different future from the towns upriver with which both have always been grouped. There is a very fundamental—and very ancient—historical scenario playing out there, one that really does repeat itself, if you view it broadly enough. The reason is the same as it has always been: there is big money to be made. That money is bringing about big changes, which at this point may have actually only begun. Pottstown and Norristown would love to have even a small part of it happening in their towns. But something’s lost when something’s gained, and the size of what is being gained suggests that the Conshohockens could lose a lot. Last week, I inquired about what West Conshohocken might be losing. Next week I shift my gaze across the river, but my focus remains on what is fundamentally happening to both communities. I do so because it is all one happening, and all for the same reason. That makes it worth understanding. Those questions are, in turn, based on a phrase that I as a historian have found to be quite useful: “That was then. But this is now, and things have changed.” In the Schuylkill Valley, not only have things changed, most of them have changed a full 180 degrees. This hold true for the Conshohockens, but their change—and theirs alone—also invokes my mantra, “The more things change ..(you know the rest)” The Conshohockens came into existence because of the intersection of two travel routes, originally the township line roads, meeting the river at Matson’s Ford. This time both are being recreated by the intersection of two roads (one of which does follow the path of the river, by the way). These are not just any roads, mind you, but two Interstate Highways. The Conshohockens now lie at an intersection that can be reached easily from a great distance (yes, I am ignoring traffic jams here, but so are the developers and buyers/renters). Upriver, only Pottstown might make this claim, but both its highways and the region they access are not in as good a shape. The intersection of these two major highways had to go somewhere, and West Conshohocken was that somewhere. The intersection arrived incrementally, as the second of the two highways—what would eventually become Interstate 476 (the “Blue Route”)—was built in segments. The initial creation of the Conshohocken off-ramp of what would become Interstate 76 dates back to the early fifties. Conshohocken got the name, but West Conshohocken got the ramp, and lost ground, residences and borough revenue in the process. By the time the whole process was completed almost forty years later, West Conshohocken had been gutted; drawn and quartered, as it were. West Conshohocken’s total area is still listed as .9 square miles. Its livable area is much smaller than that. The highways took what they needed, and left the rest. The result has been unkind to any sense of community. The new, widened and realigned roads necessary to service the much greater number of vehicles that now pass through the Borough have, in turn, divided its remaining land into pieces, each effectively cut off from one another. The absolute prioritization of vehicle traffic passing through has rendered it challenging to even walk from one section of the small borough to another. That is just looking at things from a purely physical point of view. But what about West Conshohocken’s historic sense of community identity, of its reason for being? What was once a typical locally-focused Schuylkill Valley community, where people lived, worked and worshipped in the same town, has been rent asunder; much eliminated, parts isolated and everything local de-emphasized. Can the fragments that remain even see themselves as members of a community at all? Those who descend from the old days and live in the older residential sections very likely do, but as residents of what, today’s reality, or just a memory? West Conshohocken’s historic self-image is that of a gritty mill town, overshadowed by its much larger, and even more gritty, neighbor across the river. Both are no longer mill towns, but is West Conshohocken a town at all these days? For a long time, the Borough of West Conshohocken served a purpose for both its residents and those in the nearby areas. It no longer does. The money flowing into the Conshohocken area does not respect political boundaries, and it has come close to eliminating any difference between West Conshohocken and its surroundings. The basic components of what makes a grouping of people into an actual community once existed, but no longer. Much has changed along this bend in the Schuylkill River, and the pace, as this is written, actually appears to be picking up. New office buildings and residences have physically replaced the old industries. What that means is that with a minute number of exceptions, the new residents work elsewhere while the new workers live elsewhere. That is a fundamental, one hundred eighty degree change from why the Schuylkill River towns came into existence in the first place. These days, we don’t expect a town’s temporary daylight occupants to show much interest in the community, but what about the new residents, and those who will inhabit the developments currently pending? Will these new people consider themselves residents of the Borough of West Conshohocken, or will it be just a mailing address for them? They will pay their taxes, but how many of them will vote in local elections? Will they support the George Clay Fire Company? How will they view the community in which they technically live? As anything at all? Let’s put it another way: do they have any reason to feel of sense of community about today’s West Conshohocken? What does the Borough—and being a part of it—contribute to their lives? The core of West Conshohocken has always been its ethnic churches, just as with every other town on the lower Schuylkill. St. Gertrude’s, the Borough’s first Catholic church, founded in 1888, is now closed. Does Sunday still promote a sense of community like it used to, and if not, has anything taken its place? A community’s youth was the medium in which the old traditions were passed along, accepting some of those they were taught, changing others and then passing them along in turn to their children. The Borough no longer has either an elementary, middle or high school. The ties between the Conshohockens were not strong enough to keep their children together. West Conshohocken students attend the Upper Merion School District, while those in Conshohocken are part of the Plymouth Whitemarsh School District. The answer to my first question, then, is clearly "No." What about the second one? That's up to the residents of West Conshohocken whether to even ask, let alone decide. It should be clear to anyone who looks that the reasons for West Conshohocken's birth no longer exist, and the reasons it sustained itself so long for so well no longer exist either. Both these facts are true for the other towns on the lower Schuylkill as well, which is why their futures remain uncertain. The difference is that the Conshohockens are having that future forced on them. Conshohocken's crisis lies in which path it will follow, but at least it has a choice, albeit a limited one. The problem surrounding West Conshohocken lies in the strong possibility that it has no choice at all. The forces arrayed against its continuation a a coherent community arise from the exercise of the free market economy, and they are hugely more powerful that those that can be marshaled to protect the borough's traditional community identity. The name may remain the same, but what else will, really? From an Instrument to an Institution: Why Do They Still Exist? My posts for the past several weeks have focused on the disconnect between Bureaucracy World and the real world. The bureaucracy in question has been that of the Federal Department of Housing and Urban Development (HUD), and its local extensions, the local public housing authorities. My take on them has been critical, but not compared to what else is circulating on the Internet. A quick look at Facebook alone will reveal how much national discontent with HUD exists, and how far it has spread (check out the “Occupy HUD” page, as just one example). At the core of the disconnect is the lamentable fact that HUD has ceased to be an Instrument, and has become an Institution. Understanding the difference between the two, and why the latter seems to be the inevitable fate of the former, will help to clarify what has gone wrong, not only with HUD, but the rest of the “War on Poverty,” and why we have situations like the concentration of Housing Choice Vouchers in poorer communities. Such an understanding will also help with the analysis of just about any group or organization. So much so, in fact, that I will use it beginning next week to address the situation in the Conshohockens, where a very different reality is underway. I was blessed during my undergraduate years to study under a history professor who impressed several lessons upon me, all ultimately about the difference between knowing something and actually understanding it. These lessons were already old when I first encountered them in the mid-1960s, but they have stood the test of time. One of them is the distinction between an Instrument and an Institution. An instrument is designed to fulfill a function, and when first organized, its focus is on doing just that. With the passage of time, however, the purpose for an instrument’s continuation diffuses, morphing into a focus on maintaining the physical structure—size, personnel and most of all, budget—more than actually accomplishing the task for which it was formed. The instrument becomes an institution. This slow, almost imperceptible transformation seems to be the fate of all instruments, and certainly those that arise from good intentions. The organization survives, it may likely grow, but it increasingly solidifies its right to continued existence by the fact—and length—of its existence itself. The rule of an instrument’s inevitable deterioration into an institution applies to virtually all creations of man as well as to man himself (See Paterno, Joe), but I will take a very narrow perspective, and offer the following thesis: American history has taught us that government-created instruments are more liable to suffer this transformation, and are much more resistant to correction. The general impossibility of the formal goal such instruments are charged with, from winning “The War on Poverty” to protecting “America’s National Interests”) is tacitly accepted, and keeping things from getting worse is considered success. So the instrument enters the fray, slowly but surely recognizes the impossibility of “victory,” and turns the inevitable disillusionment into individual methods of balancing continued commitment with career advancement and eventual retirement. Those who labor within an institution must accept their obvious inadequacy and the ultimate futility of what they are trying to accomplish. How they work through that dilemma determines whether they are on the instrument or institution side of the bureaucracy’s internal struggle. Staying on the instrument side is difficult to sustain, and those who manage to do so should be celebrated, not cast into the same rhetorical pit with those “bureaucrats” we all love to castigate. Let’s not forget the military in all of this; the Pentagon has pretty much defined How To Succeed at Bureaucracy, but then again, “America’s National Interest” is a very elastic phrase, and one that trumps “help the poor” just about every time. But I digress. The Federal Department of Housing and Urban Development (HUD), which administers the housing subsidy programs, is excellent an example of this unfortunate evolutionary process. It is simultaneously a sad commentary on how even a failed approach must be continued to avoid making things even worse. I’ll bet that each and every one of you can quickly name another program—or even an entire department—of the Federal government that you believe fits this description, one that has ceased to serve the purpose for which it was created, and now exists largely to perpetuate its own existence. Like shooting fish in a barrel, right? But how about closer to home? Let’s start with the Commonwealth of Pennsylvania itself. In searching for such instruments-become-institutions at the state level, we need look no further than how alcohol is sold in Pennsylvania. Few examples of my subject—at any level of government—stand out more blatantly than the Pennsylvania State Liquor Control Board. Does the reason for which it was created even still exist? If not, shouldn’t the whole system be eliminated? Anything further I might add to that subject would be just piling on, but those two questions should be asked of each and every institution, particularly those of government. Tune in next week for that. Okay, that was easy. Dare I come still closer to home? I know full well the passion that can arise when certain local sacred cows are questioned, as I have sat through a number of such confrontations (and, in truth, contributed to a few). Local police forces are one. For a very long time, separate township and municipal police forces were necessary. These were the days of slow travel and even slower communications; crime was overwhelmingly local, and best combatted by locals who knew the territory. But that was then. This is now, and things have changed. Criminals routinely use the highways to range over the territory of several municipalities, and their information gathering systems range much farther than that. Still, periodic trial balloons floated about combining local municipal police departments into more regional ones go down in flames before the impassioned opposition of local residents. Paradoxically, these traditionalists are sustained by the information revolution, which greatly facilitates local law enforcement while keeping the payroll down. But I propose to offer next week an example on an even more fundamental level, that of a municipality itself. I do so at considerable risk, because I know from experience that when my take on recent urban history gores someone’s sacred cow, their anger and astonishment will be unaccompanied by any continued appreciation of what I am trying to do, however well they understood my point when it was aimed at someone else. I know better, but I can't resist. Next week I will ask the question "Does West Conshohocken Still Have A Reason To Exist?"